Nothing makes you feel more rejuvenating than getting pampered in a full-hand treatment. Relax in a hand massage, scrubs, moisture masks, paraffin bath and more to make your skin feel hydrated, soft and radiant. A full-hand treatment will help to revive rough, dry, chapped hands using the best products on your skin. Our technicians use massage techniques that take advantage of the pressure points in the hands shown on the reflexology chart on the right to increase circulation in the skin. 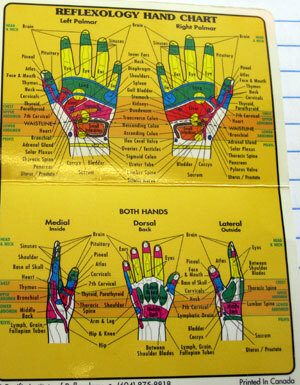 The hand treatment involves the focus of the pressure points on the reflexology hand chart. Followed by your choice of polish. The Gold Manicure treatment also provides a hand massage using the reflexology hand chart to increase circulation. The Diamond Manicure Deluxe service also provides a hand massage using the reflexology hand chart to increase circulation. The Diamond Special Manicure service also provides a hand massage using the reflexology hand chart to increase circulation.